about 62 inches long customizable. This if the final installment of my leaf collection, one for each season. Hydref is the Welsh word for Autumn and this pattern allows you to create fall leaves you can keep with you the whole year. 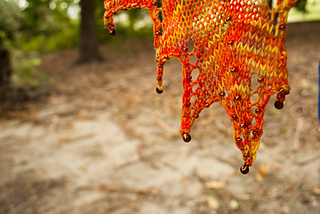 Worked in one piece as you go the leaves are created two at a time, as you begin one you bind off another. This is a fantastic pattern for solid, variegated and tonal yarns, I do not recommend gradient or self striping. 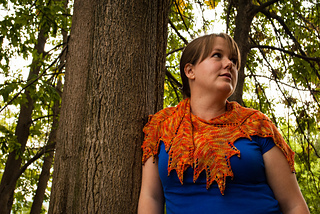 Use 400 yards to make a small scarf that wraps around your neck (pictured) or use as much yarn as you like and keep making as many leaves as you want. Each section takes 7 drop beads. 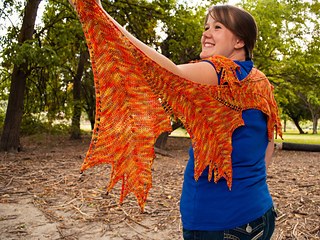 Ellen at Earthfaire has put together some amazing kits with the yarn and beads shown as well as some other choices.